Does our attitude towards aging increase Alzheimer Dementia? For the last few years, I’ve worked as a doctor for a number of my local nursing homes. On my morning rounds, I would literally reintroduce myself to every second patient, because even though I’d seen them every week for the previous few months, they still couldn’t remember who I was. And it’s not just because I have a less than memorable face. Most of my nursing home residents had dementia. While there are many different causes for dementia, the one first described by Mr Alzheimer in the (early 1900’s) is the best known and most feared. It is also the most common, and is a significant drain on the nation’s economy as well as the quality of life in the twilight of years. Recently, an article was published by a group of researchers from Yale University in the US which claimed to show that the attitude a person had towards aging contributes to their chances of Alzheimer Disease. I first saw it yesterday on the social media feed of Dr Caroline Leaf, communication pathologist and self-titled cognitive neuroscientist. Dr Leaf is known for her scientifically dubious assumptions that the mind changes the brain, not the other way around, and has previously publically stated that dementia was caused by toxic thinking. This article seems to vindicate her assumptions. However, this article also made it onto Facebook’s trending list ands was picked up by news site all over the world (such as this article in the Australian http://goo.gl/RavbMl), so the interest wasn’t just from Dr Leaf, but also from the broader public. And I can understand why. No one wants to ‘grow old and senile’, or to ‘lose our marbles’. Any potential cure or prevention for Alzheimer Dementia is worth paying attention to. I admit, the headline intrigued me too, both personally and professionally. I wasn’t aware that one’s attitude towards aging would contribute to Alzheimers, since Alzheimers is predominantly genetic, and the other associated risk factors have more to do with physical health (like diabetes, high blood pressure etc). Psychological stress is a risk factor for Alzheimers in mice, but good evidence in humans has been lacking . So, does negative attitudes to aging really cause stress which then leads to Alzheimers as the report suggested, or is there a much better explanation? The scientific article that the news reports were based on is A Culture-Brain Link: Negative Age Stereotypes Predict Alzheimer’s Disease Biomarkers . This study was done in two stages. Volunteers were recruited from a larger study called the Baltimore Longitudinal Study of Aging. At entry point, the participants answered a questionnaire about their attitudes towards aging. This was about 25 years before the participants were actively studied. The first study examined the change in volume of a part of the brain called the hippocampus (which plays an essential part in our memory system). The second part of the study examined the volunteers’ brains at autopsy for markers of Alzheimer Dementia, namely ‘plaques’ and ‘tangles’. The number of plaques tangles were combined to form a single composite score, which was then compared to the baseline attitude towards aging score. In the first study, the researchers reported that those people who held negative views of aging were more likely to have a smaller hippocampus which more rapidly decreased in size over time. In the second study, the researchers reported that those people who held negative views of aging were more likely to have more plaques and tangles in their brain. On the surface, this seems to suggest that people who hold negative views on aging contribute to the development of Alzheimer Dementia, and certainly this is how the different news agencies seemed to interpret the outcomes of the study. Though on deeper palpation, a number of questions arise about how the researchers did the study and chose to interpret the results. Levy and her researchers also report that the average size of the hippocampus changed significantly when they averaged the size of the left and the right hippocampus. But when they analyzed the two sides separately, there was no significant change over time. So this makes me wonder about the validity of their analysis too – if the volume of each side separately doesn’t change much at all, then how can the average volume of the two sides change so much? I’m not much of a statistician, but I wonder if the secret’s in their modeling. They used a linear regression model to compare their data to their hypothesis, a legitimate statistical method, but which involves adjustment for other variables. If you do enough adjusting, you can get a significant result statistically, but according to their numbers, their Cohen’s d was 0.29, which is considered a weak effect overall. Then there’s the question of clinical significance. Even if the hippocampus did shrink in those who thought aging was negative two decades ago, was the shrinkage enough to contribute to the cognitive impairment seen in Alzheimer Dementia? When compared to other studies, probably not. Looking at Levy’s graph, the “negative” attitudes group changed about 150mm3 over the 10 year follow up period, or about 5%. A recent study also showed that the the hippocampal size of subjects with mild memory loss is about 12% less than a healthy age matched control . The same problems are seen in study 2 – Levy and her researchers reported an increase in the number of plaques and tangles in the “aging is bad” group. But her numbers are small, and not statistically strong. And again, the question of clinical significance arises. Plaques and tangles represent biomarkers of Alzheimer Dementia, not necessarily a diagnosis. Normal aging brains without dementia also have plaques and tangles, and it’s the number of tangles that seem more significant for developing cognitive impairment [4, 5], not the combined score that they used in this study. And when all is said and done, all Levy and colleagues have shown is a correlation between attitude to aging and changes in the brain. But correlation does not equal causation. Just because two things are associated does not mean that one causes the other. There maybe another variable or factor that causes both observations to co-occur. In Levy’s case, the common connecting cause could easily be neuroticism, which they discussed as a co-variant but did not say if or how they corrected for it. The other thing they did not examine in this study is the ApoE gene subtypes, which contribute significantly to the onset of Alzheimer Dementia . The action of ApoE subtypes in the brain may contribute to both negative attitudes and Alzheimers changes? The bottom line is that Levy’s study shows a weak correlation between a single historical sample of attitude towards aging, and some changes in the brain that are known to be markers for Alzheimer Dementia some three decades later. They’ve certainly NOT shown that stress, or a person’s attitude to aging, in anyway causes Alzheimer Dementia. They did not correct for genetics in this study which is the major contributor to the risk of developing Alzheimers. So the results mean very little as it stands, and further research is required to delineate the cause and effect relationship here. So don’t stress. It’s not definitely proven that how you view the aging process determines your risk of dementia. 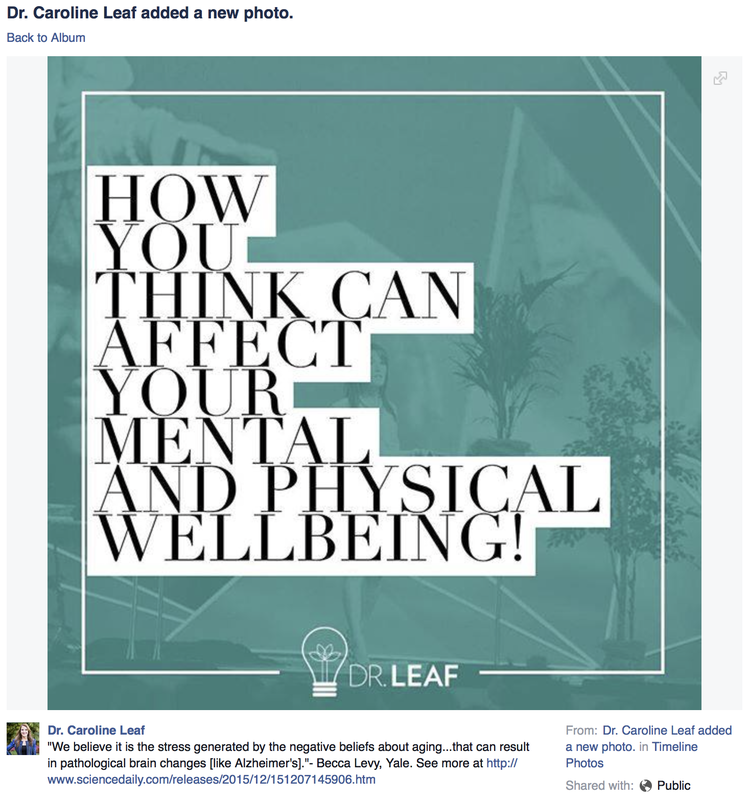 There will be those like Dr Leaf who will trot out this cherry-picked little titbit of information in the future to try and justify their pretense that thought can change our brain and impact our mental health, but what the press release says and what the study shows appear to be two different things altogether. Reitz C, Brayne C, Mayeux R. Epidemiology of Alzheimer disease. Nat Rev Neurol 2011 Mar;7(3):137-52. Levy BR, Slade MD, Ferrucci L, Zonderman AB, Troncoso J, Resnick SM. A Culture-Brain Link: Negative Age Stereotypes Predict Alzheimer’s Disease Biomarkers. Psychology and Aging 2015;30(4). Apostolova LG, Green AE, Babakchanian S, et al. Hippocampal atrophy and ventricular enlargement in normal aging, mild cognitive impairment (MCI), and Alzheimer Disease. Alzheimer Dis Assoc Disord 2012 Jan-Mar;26(1):17-27. Nelson PT, Alafuzoff I, Bigio EH, et al. Correlation of Alzheimer disease neuropathologic changes with cognitive status: a review of the literature. J Neuropathol Exp Neurol 2012 May;71(5):362-81. Jansen WJ, Ossenkoppele R, Knol DL, et al. Prevalence of cerebral amyloid pathology in persons without dementia: a meta-analysis. JAMA : the journal of the American Medical Association 2015 May 19;313(19):1924-38. Liu CC, Kanekiyo T, Xu H, Bu G. Apolipoprotein E and Alzheimer disease: risk, mechanisms and therapy. Nat Rev Neurol 2013 Feb;9(2):106-18. This entry was posted in Biological, Caroline Leaf, Psychological and tagged A Culture-Brain Link: Negative Age Stereotypes Predict Alzheimer's Disease Biomarkers, Alzheimer Dementia, Baltimore Longitudinal Study of Aging, cognitive impairment, cognitive neuroscientist, dementia, dr caroline leaf, Levy, psychology and aging by cedwardpitt. Bookmark the permalink. I’ve just read the paper(Levy, 2015), and I’d like to discuss two questions you mentioned in your post. Your are right, the attitudes to aging may be changed during the process of aging. But I think the main point of the research is to explore whether attitudes held in a younger age can predict brain changes in the older age. I think the analysis means that the changes of the left and the right hippocampus are similar. Hi Ling, Thanks for your comments. In regards to Levy, your comments are very fair, and you’re probably right. I understand what Levy was trying to do, but for me, such a long time frame between initial attitudes and outcomes weakens her findings and conclusions. It’s a bit like trying to prove whether what children say they want to be when they grow up in kindergarten has any influence on their eventual profession at age 30. I’m not sure if that’s the best analogy, but you get the idea. As for the hippocampus changes, if I have misread Levy’s analysis, then you have my apologies. I’m still not sure if they adequately considered confounding factors though, so I’m still not entirely convinced of the study’s conclusions. Though it’s certainly an interesting one to consider. Thanks again for the feedback. It’s truely much appreciated.